Luckily, Hurricane Irene was very mild for the area I live in - but I prepared for the worst- I even decided to go hang out at my parent's from Saturday afternoon until yesterday. The power flickered and that was it. During Gregory's naps I took advantage of my parent's cable and DVR and watched/listened to several episodes of "What Not to Wear" and "Law and Order." 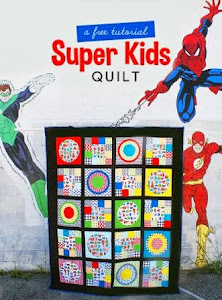 It really helped to get me through the very monotonous task of sewing the dresden plates onto the background squares: When I got home last night, I finished the last of these Children at Play blocks. I have to say that I like the fussy cut squares of these prints - but I find that these styles of prints limit my creativity a bit- I am much more used to using prints and color rather than trying to fuss with little character/novelty images. I am off to Louisville on Friday to reunite with my hubby and visit his parents with Gregory. We were going to squeeze a visit of Paducah in - but there just isn't enough time. But you better believe I hope to squeeze a quick visit to a quilt store that I heard is excellent. I am really excited to be with Nick again and finally allow Gregory to see his grandparents- as it has been over a year now since we last all got together! You all might be sick of this quilt by now but unfortunately, at least one more post is coming (when I finally finish it!). I would love to hear opinions on whether I should add a few borders. I am thinking: 1st a small white border, followed two gray and purple borders that are a little thicker than the white (maybe 3 inches each?). P.S. Thanks for all the empathizing and supportive comments regarding the Hushabye sampler that I hated. I'd never written a post like that because usually I like what I make. I am going to finish it - but not for a while - it's time to focus on other things. #92. I hate doing sashing for quilts - it's not as easy as it looks and I rarely can do it right. #102. I had my doubts about using the saturated brown prints in some of the blocks - and then I went ahead and clustered them all together - which makes it even worse. #111. I liked Hushabye, but now I can't bear to look at it anymore. I am hanging onto some of my yardage of the owl prints - but the rest is being destashed on etsy. I totally understand the wisdom of "finishing what you start." But I once read some advice on flickr to a woman who wasn't sure if she should finish up a hand pieced hexagon quilt that she hated. The comment said something to the effect of, "Sometimes we spend too much time and money on projects we aren't enjoying and it's often better to just move on and spend our efforts on things we are excited about/enjoy more." 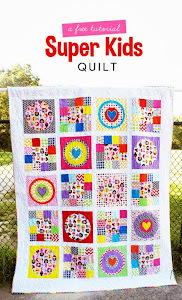 Last week I finished up all of my dresden plates for the Dotty for Dresden quilt. There are 30, as I am adding a full column to the pattern in order to make the quilt queen sized. I am really pleased with how they came out. I put the pieces together randomly - just trying not to have same colors touching and having no fabrics repeated within the plate. All of my WIP's are kind of overwhelming me right now! This weekend I have been trying to put together the top of the Hushabye sampler quilt.... I would much rather work with the above projects but I will get to them as soon as possible. The World Quilt Show in Manchester, NH did not disappoint. The quilts on display were very diverse - there was something there for everyone! I love how they have quilts from all over the world - Japan, South Africa, England, Germany, etc. This quilt was from Germany and I was mainly inspired by the unique color pallette. This floral quilt was a collaborative effort from a guild in Capetown, South Africa. I thought it was absolutely gorgeous! There were so many vendors at the show, it was a bit overwhelming. I was very interested in "Dusty's Vintage" - a small company in MA that sells vintage tablecloths, buttons, trims, and fabrics. I bought two cuts from the 1950's - the purple and red paisley and a lavendar/green floral feedsack - a full yard of each. I am sure it's rare to find such old and pretty fabric in such pristine condition. These fabrics are sitting on a backdrop of a new Denyse Schmidt Sugar Creek print - Whimsy Bouquet - I am going to use it to back my dresden quilt. After I got home from the show - I took my son to Nashua to hunt some down - I was a woman on a mission! I also got this horrifying novelty print at the World Quilt Show, my son really loves motorcycles. PJ pants are in order I think. Working with the selvedges was fun - I am now glad that I saved them. When choosing which ones to use - I simply looked for ones with lots of lettering or circle/colored dots. I would recommend, when working with selvedges- when sewing them onto the background square - use a square a little larger than the measurement of what you want to end up with. I found that all of my sewing made the piece a bit wonky and I had to cut it to size at the end and some of the edges didn't end up having the "support" of the background square. The only alteration I did to Amy's tutorial was adding a flannel bag of rice into the pincushion in order to make it have more weight. I gave this small gift to Monet at the end of our afternoon at the World Quilt Show. I will post about the show tomorrow. Right now I am feeling a little overstimulated by being at the show most of the day (SO many beautiful quilts and SO many vendors!) but I also feel a little overwhelmed. Monet was the founder and leader of our guild and has worked tirelessly to create a very meaningful organization and she also has been a wonderful, true friend. I am going to miss her terribly as she heads off to law school. Her departure not only means that I won't get to see her much but it also signals the transition for me to go from being vice president to president. I love the guild and I am excited to continue working as an officer - but of course it is a little intimidating! I have to say that I am more than grateful to Monet for providing a wonderful foundation to a group that I hope will thrive for many more years. The night before my SIL came to town- I hurriedly tried to put this top together so that I wouldn't have the rows lying all over the place. I put in the movie "Catch Me if You Can" and was done by 10:30 pm. I was also in a rush because I thought I might want to bring it to Marden's to choose a backing - but I realized I had something in my stash that will do. I have to say that I am really happy with how it turned out. I am kind of surprised by its large size, even though I planned it that way- 90" x 92". The reason why I wanted to make this quilt is because I wanted an excuse to use some of the gray and black fabrics that I own and love. But I don't think I would ever be content to make something without much color - so that is why I added some blue and red prints (my favorite colors). I kind of like to think of it as a black and white photo with some color added to it. Fabrics I used include Half Moon by Moda, Henna Garden, Cathedral by AMH, gray Wishing flowers, Daiwabo gray elephants, Pearl Bracelet, Avalon bikes, Ribbon Flowers from KJR, Cherry Wallflower, etc. The neutrals I used were Kona Snow, White, Ash, and Bone. The pattern was inspired from Strips and Bricks by Malka Dubrasky. It may be a while before I get the opportunity to baste and quilt this beast but hopefully I can show its' completion soon. My SIL, Melissa, is visiting from Texas this week. Although she is really busy with work and school, she does enjoy sewing and has made a few quilts in the past couple of years. She brought Gregory a quilt she made and he loves it- I will post that tomorrow. This quilt was my favorite - probably since I seem to have a thing for trees. I wrote down the name of the pattern and I am going to try to find it and do this someday in modern fabrics. I have been doing a little sewing while Melissa is here. I whipped together my first dresden plate in about 10 minutes. I am telling you - once you have the "prep work" of making all of the fan blades, these things fly out of your machine in no time. The Maryoshka doll piece is made by Hallmark (who knew they made fabric?! ), the woodgrain is a Timeless treasure print, and the red print is a perfect backing for the girl quilt I am planning for my friend. The two KJR finds were from Lowell show today - I was ecstatic to find them because they are literally both my most favorite prints from that collection and I had very little!